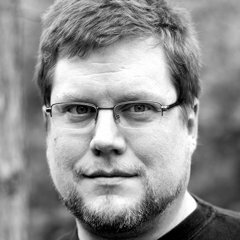 A map was at the centre of a major news story in the United States this week. Within hours of the news that Rep. Gabrielle Giffords (among others, to be sure) had been shot at a constituency meeting in Tucson, Arizona, copies of a map from Sarah Palin’s political action committee, first released a year ago, began circulating online in response. The map targeted for defeat 20 Democratic members of the U.S. House of Representatives who voted for health care reform but who represented districts carried by McCain-Palin in 2008 — and it did so with crosshairs. Rep. Giffords was one of those members, and in the anger and confusion that followed the shootings, it was very easy for some to see in the map a call that was taken a little too literally by the shooter. There’s been an awful lot of debate since that weekend about rhetoric and responsibility — and what the map really meant (surveyor’s marks?!) — that I won’t get into here; I just feel it’s necessary for me to note the role of the map’s design in the ensuing fracas. 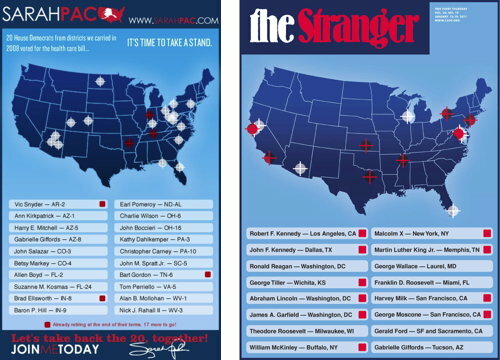 And I should also note a map that has been made in response to the SarahPAC map: a remix by alternative weekly The Stranger showing political assassination attempts — successful and otherwise — going back as far as Lincoln (via Andrew Sullivan).